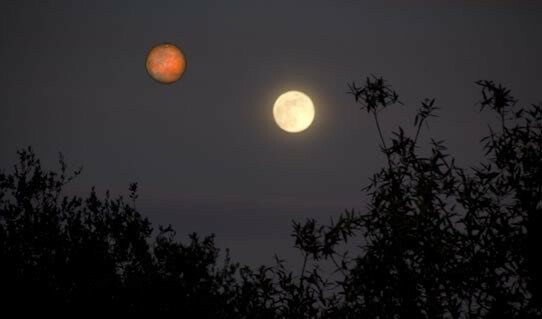 No, Mars will not appear as big as the Moon tomorrow night. I’m sure that’s a fact most of you already know, but the rumor has made its annual return to social media, so I figure it’s worth stating again. The image you see above, as well as other similar images, is fake. For many, this rumor marks the beginning of the Fall season. The leaves begin to change, children return to school, and this rumor spreads across Facebook like a prairie wildfire. It seems to date back to 2003, when around this time Mars approached opposition. Opposition is when the Sun, Earth and planet are all along a straight line, so that the planet is highest in the sky at midnight. Mercury and Venus can never be at opposition, since their orbits are inside the orbit of Earth. The 2008 Lunar occultation of Mars gives a better comparison of their relative sizes in the sky. When a planet like Mars is at opposition, it is basically as close to Earth as it can possibly be, and since it is opposite the Sun it is easily seen in the dark of night. So opposition is typically when Mars is at its largest and brightest. 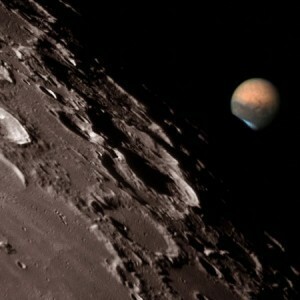 But even then the apparent size of Mars is not remotely that of the Moon. Mars is larger than the moon, but also much farther away, and it is the combination of the two that determines an object’s apparent size. When Mars is at opposition, it isn’t always at its largest apparent size. In fact, it is usually slightly smaller than its maximum size. Earth and Mars don’t have perfectly circular orbits, so if opposition occurs when Mars is farthest from the Sun (at aphelion) it will look smaller. When opposition occurs when Mars is closest to the Sun (at perihelion) it will be larger. The last time Mars opposition was near perihelion was in 2003, hence the rumor. The next time it will be near perihelion is in July of 2018. I’m sure you’ll get a heads up when the rumor appears once again.